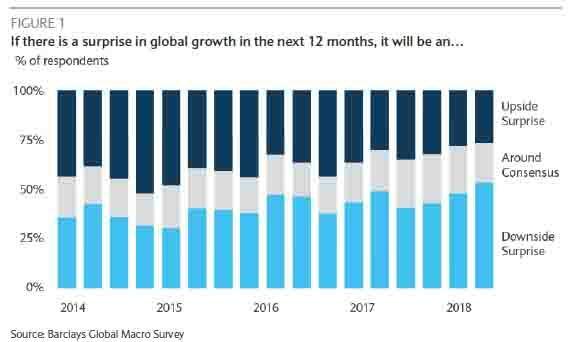 global growth - Is the economy likely to perform similarly to consensus expectations, and if not, will it disappoint or delight - for the first time in at least four years, more than half of respondents responded that a disappointment lies ahead. When asked where growth disappointment come from, Barclays notes that China has traditionally been the most frequently cited global growth risk. 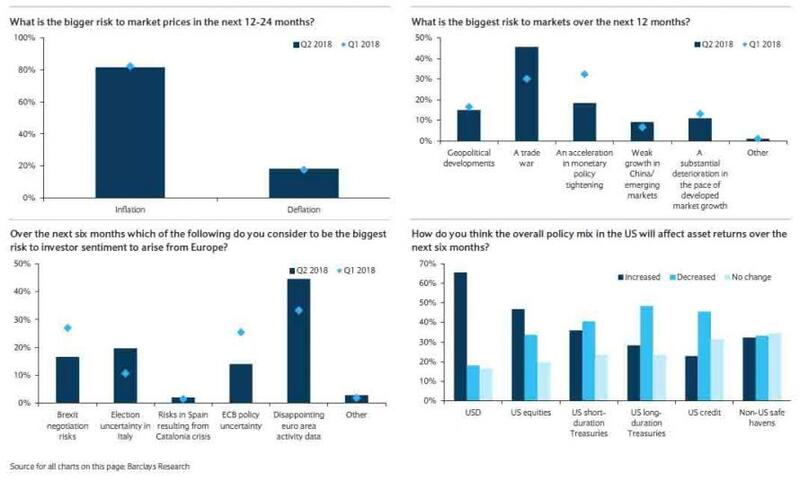 But the weightings have shifted substantially: while China is still viewed as the most likely to surprise on the downside, the possibility of a disappointment from Europe, and from the rest of the emerging markets, has surged over the last three months. And whereas last quarter, only one in four respondents thought EM would disappoint. Today, more than half think so. Meanwhile, as growth leadership has shifted back to the United States, so have expectations about returns. Survey respondents now overwhelmingly think the US will produce the best returns over the next three months. Perhaps explaining the recent outperformance of the US relative to the rest of the word, in equity markets, 60% think the US will outperform. In high grade credit, investors prefer the US over Europe seven to one, while 64% of FX investors prefer the USD as a long. For context, the next nearest most popular long is the Australian dollar, with only 11% of votes. Only 15% see the USD as a good short. Here a familiar paradox emerges: despite this apparent enthusiasm for all things American, and optimism about the US economy, survey respondents question the Fed’s desire - or ability - to tighten policy. As a reminder, the FOMC's dot plot continues to signal two further 25bp rate increases this year, three increases next year, and one further hike in 2020. This would take the funds rate from the current 2% up to 3.5%. And yet survey respondents think the peak funds rate will top out at only 3%, or after just 4 more hikes, suggesting the market is confident financial conditions will remains far looser than what the Fed is telegraphing. Meanwhile, investors are confident that US 10y yields should rise, but only slightly from current levels. 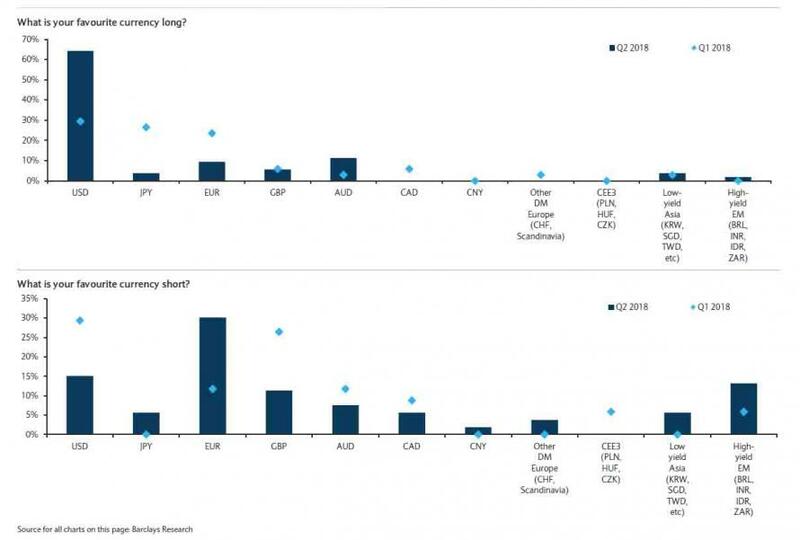 It is therefore hardly surprising that when asked what is their favorite currency longs, an overwhelming majority said the USD - nearly double the number from Q1 - offset by a spike in EUR shorts. Finally, what are the risks? Here respondents were more divide, with EM investors most concerned about tighter developed market monetary policy. What is perhaps surprising, though, is that the risks posed by a trade war did not feature more prominently. Only 15% of EM investors in local markets feel that trade protectionism is the key risk. 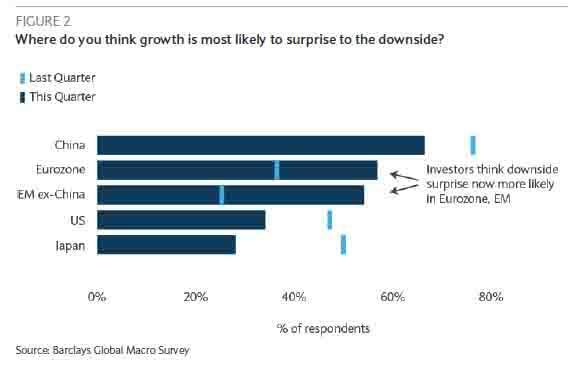 When asked about Europe-specific risks, investors said disappointing economic growth is still the largest concern. But from investors overall, on a global basis, the message is clear: a trade war is the biggest concern for almost half of those surveyed, and threatens to poke holes in an already patchier economic outlook.